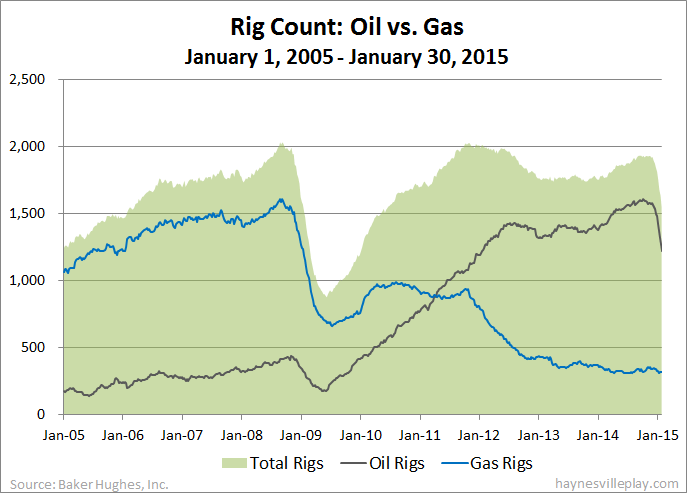 The Baker Hughes U.S. rig count continued its plummet this week, dropping 90 rigs to 1,543. This is the lowest rig count since June 18, 2010 when the stats were actually flip-flopped and there were 574 oil rigs and 953 gas rigs because shale oil drilling was just taking off. This week, oil rigs were down 94 to 1,223, gas rigs were up three to 319 and miscellaneous rigs were up one to one. By type, horizontal rigs were down 61 to 1,168, vertical rigs were down 23 to 235 and directional rigs were down six to 140. Among gas rigs, horizontal rigs were up five to 240, directional rigs were up one to 49 and vertical rigs were down three to 30.